To those new in this blog, I track my spending every month. 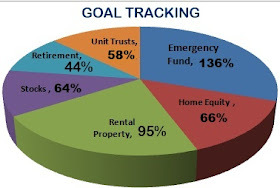 My goal is to spend 50% of my income in order to retire comfortably in my early 40s. September 2012 monthly spending and budget report in one sentence... "High spending and low income month". Last month was not bad with me going through only 34% of my income for the month. We had a mini holiday/ get away with the kids and a big trip for the two of us. I enjoyed the trip as we hooked up with my parents in the mix. That's always an amazing thing. Anyway, my miserable spending report follows. Hubby Allowance 49% 53% I must say he gave me a bail out due to the duplex repairs coupled with the legal fees on the new rental property transaction. Once Off 1% 2% Interest free loan I gave to a friend. She is paying monthly. Online Income 0% 0% I will get two months worth this month. I didn't. My one cheque delayed for some reasons and I had to just cancel it with the company. Extra 4% 5% Interest on my Emergency Fund. Dividends were ZERO again.Plus dividends, YAY!!! Interest on my Emergency Fund is always a welcome addition. Two companies paid out dividends. The Mr did far better on the dividends. Real Estate 13.6% 20% My one and only mortgage. I decided to pay all the home owners association fees and taxes/rates three months in advance so I dont pay them monthly. I will only pay these end of September/ beginning of October. RA & Unit Trusts 6.2% 8% Fixed for my life insurance and the rest of small investments and savings. Consumer 1.8% 19% This is high due to travel. Withdrawals&Fees 0.3% 1% Also due to the holiday and trip. Giving 11.2% 21% I have been a bit of a Santa Clause. From here, no Christmas gifts from me. I mean it. To Invest 66% 20% 20% is not bad at all for such a hectic month. I paid nothing to my homeloan, but the Mr did. Like every month I topped up my Just Invest (Nedbank) interest. Whatever interest I get, I top up to make it a round R5000 figure. The leftover amount was paid over to lawyers for the transfer/ registration of the rental property I am buying. I lived on 80% of my income in September (comparing to 34% in August). I had to get a bit from our savings to add into legal fees. My Net Worth grew by R56,400 in September (yes, I decided to keep track of this too now.) This is the growth in various investment vehicles and home equity. I said I will be paying all my extra income into my homeloan to fast track bond payment. I changed my mind. If things go well, I may use part of my emergency fund to finance the rental property I am buying in a small SA town. I am paying cash for it and have the tenants waiting for the registration already. It seems that the transaction will drag. But that gives me time to build into my emergency fund from October, in order to have my EF at 12 months expenses after paying the new property.